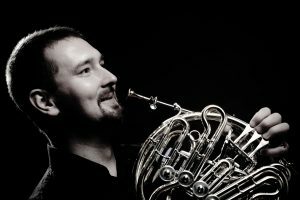 Tadeusz Tomaszewski – French horn. He graduated from S. Moniuszko music school and K. Szymanowski music school in Katowice. As a secondary school student he was being awarded at many reviews and wind instrument competitions – in Częstochowa and Opole, among others. As a member of a wind quintet he placed 2nd in the Chamber MusicCompetition in Wrocław in 1992. In 1994 he won 3rd prize at the 1st National Young French Horn Players Festival in Łódź. In 1995 he participated in musical workshops at the International French Horn Festival in Budapest. While at the Academy of Music in Kraków, he participated in the courses held as part of the International Bach Academy, hosted by H. Rilling in Stuttgart and in workshops dedicated to chamber and orchestral music in Sweden. In 1998, as a member of a wind quintet, he won 3rd prize at the International K. Bacewicz Chamber Music Competition and 2nd prize at the 2nd National Young French Horn Players Festival in Łódź. He also received the Minister of Culture and Art scholarship. In 2000 he graduated from the Academy of Music in Kraków, where he was in the class of senior lecturer Kazimierz Pamuła. He worked with the Capella Cracoviensis, Sinfonietta Cracovia and Sinfonia Varsovia orchestras. He is currently employed in the National Polish Radio Symphonic Orchestra in Katowice as first French and is a member of the Kraków Wind Quintet. He is an active teacher. In the years of 2003-2006 he was a French horn teacher in the Stanisław Moniuszko General Primary and Secondary State Music School in Bielsko-Biała. Since 2012 he has been a teacher at the Academy of Music in Kraków, where he achieved title Doctor of Musical Arts in 2017. HORNCLASS | Powered by Mantra & WordPress.